The present day Regiment has around 80 members, it was formed over 40 years ago and has a history nearly as long as the Sealed Knot itself. During this time we have organised major reenactments of both the Newbury battles along with many other smaller events and demonstrations. Earl Rivers Regiment during the winter of 1642/43 of the English Civil War were garrisoned at Wallingford Castle, but they moved on to join the Kings Oxford Army the following summer. They took part in almost all the major battles and later engagements, throughout the war, in and around Donnington Castle. The Regiment from 2011 will join our ancestors and will be wearing the Blue suits issued to the Oxford Army in 1643. During the year the Sealed Knot puts on hundreds of events throughout Britain and sometimes even overseas. 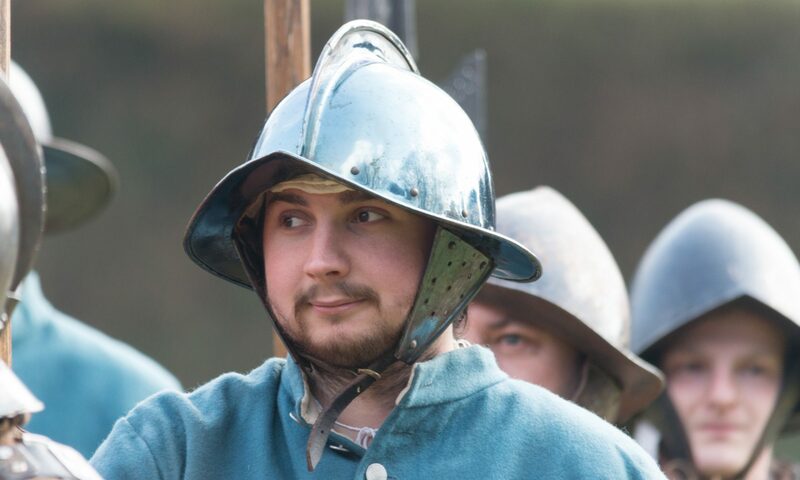 These range from Major Musters, where literally thousands of members will come together to re-enact a large battle, to small displays where members from one or two regiments will show the way of life of the people of the period, together with the tools and weapons used by them, at local museums, school fetes etc. As a member of Earl Rivers’ Regiment we don’t expect you to turn up to every event – that would be impossible. Instead go to those events that you can afford to. At a normal weekend muster your services will be required only for 2 or so hours in the afternoons and an hour or so for drill on one morning. The rest of the weekend is your own to spend socialising on the campsite, visiting local sites of interest or just soaking up the sun (well OK you might be soaking up the rain). At the beginning of each season, usually at the Regimental AGM, we decide on 4 or 5 musters at which we try to get a full turnout of members. If you can only manage to get to a few then try for these ones, you will be frequently reminded of them on the Regimental forum, by e-mail or by phone, while full details of how to get there will appear in the SK magazine ‘Orders of the Daye’ or on the Members only area on the SK website. We’re not just focused on the battlefield either as we have an ever growing number of members concentrating on the civilian side of life with our living history encampment, which holds a number of crafts that even visitors of today, will be familiar with. We feel that it is important to portray a well rounded view of 17th century life and you may want to find out more about our different roles on our roles page. We work hard to portray a realistic and authentic representation of our past, but that doesn’t mean we don’t have fun. You’ll find a whole new bunch of friends waiting for you in our Regiment with social events such as BBQ’s , Regimental get-togethers and trips to the beer tent when at musters.